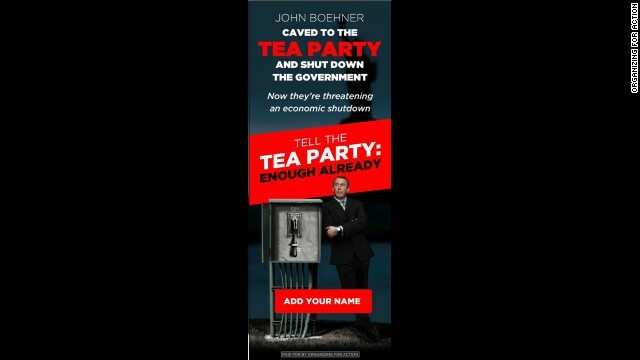 "John Boehner caved to the Tea Party and shut down the government," the ads read. "Tell the Tea Party: Enough Already." Clicking on the ad will direct people to BarackObama.com/enough-already, where they can sign up for the OFA's email list and donate to the group in support of ending the government shutdown. Earlier Monday OFA, the political organization that evolved out of President Obama's re-election campaign, began running its second TV ad attacking congressional Republicans for shutting down the government. The spot, which the group says will run for a week on national cable TV, features clips of House Republicans, in cable new interviews, seemingly celebrating the effects of the government shutdown. In addition to paying to get its message out, OFA has also organized events and social media campaigns meant to put pressure on Republicans to heed the president's call to reopen the government by passing a clean continuing resolution. House Republicans have insisted that any bill to fund the government be accompanied by changes to the president's signature health care law, the Affordable Care Act. If 22 republican congressmen have told their home town newspapers or tweeted they would vote for a clean CR, then Boehner is wrong again and cannot even count to 217. 195 democrats and 22 republicans makes 217 votes and will keep our government open. Have the vote you bum. I for one do not want the affordable health care program at all, it may have been a different store if I had a choice weather or not to take it or leave it. I really do not think our President has the people of this great nation in mind when every thing I have been reading on Facebook is "WE THE PEOPLE" do not want government ran health care. The government can run the government much less health care. It has been fairly entertaining (if it wasn't so frightening) watching Speaker Boehner wing it, and improvise with our economy – like some drug addled third rate jazz musician searching for the lost note during a solo that isn't even his turn to blow. It is ironic that it is often the same people who don't get their way politically and who speak with contempt about the legitimacy of the government – with many actually willing to do the country harm or undermine its democratic principles in order to achieve their own goals – who are the first in line to praise the military or display the flag. Frankly, I would consider those who gleefully called for the shutdown of the government and who play brinksmanship with the full faith and credit of America as no more patriotic than the traitors who fired on Fort Sumter and started the Civil War. Boehner has caved to the teapublicans because he doesn't want to lose the speaker-ship. The question would be if he lost it who would replace him. Would we get someone who is better and more willing to compromise or some even more reactionary nut job. Tell the Tea Party it is time to move where they will be appreciated. Somalia. Over the weekend, Rep. Michele Bachmann seemed to confirm what the congresswoman has long hinted: that she believes we are all currently living in the end of days, as fortold by the End Times scripture in the Bible. Tell OFA enough already. How embarassing for the president that a political action committee is attempting to do his work for him. The OFA can't negotiate, they simply propagate one side's view. Grow up. Howard Schultz, Starbucks Corp's outspoken CEO, on Monday urged fellow business leaders to ratchet up the pressure on U.S. political leaders to end the stalemate that has partially shut down the federal government since last week. Coffee time for the TeaParty ! Good idea. Enough is Enough. No more words.Action! So where are our Obamacare enrollment stats? Bet this group sailed right through the IRS tax exempt status check. I know a lot of people probably feel sorry for the GOP. I'm not one of them. The GOP embraced the Tea Party in order to let them do the dirty work and they (the GOP) wouldn't have to get their hands dirty. 2008 changed the game when it came to politics and many people still can't handle it. The Tea Party is destroying the GOP from within, and I'm loving it! Carry on boys. Meh to the banner ad, but the second TV ad is superb. I have contacted my Representative and Senators urging them to Defund Obamacare and cut government spending – Organize for Action needs to wake up and smell the coffee......and get their hand out of everybody elses pockets! Get rid off all these Teaparty, Beer party, Coffee party, GOP clowns out in 2014, if you are a true American for this nation's good. Drive this evil away. God bless. The message that Democrats are not getting out is that they have already compromised with the Tea Party by accepting their spending levels. But, the Tea Party wants more. They keep moving the goal posts. What is the Tea Party conceding? Nothing.